I've got an ARP Avatar and Odyssey so I wanted an ARP style filter in my modular. 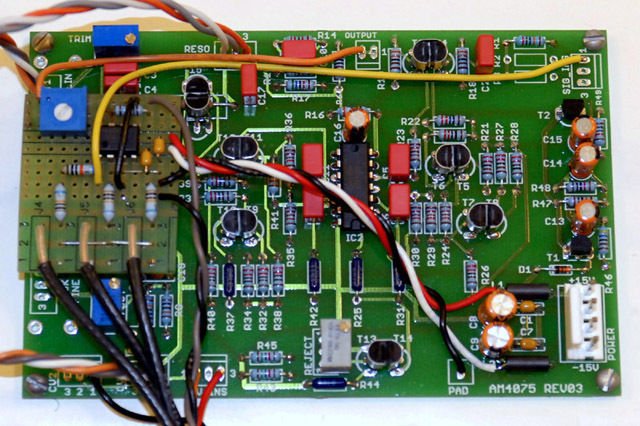 I chose to build the Analog Metropolis AM4075 ARP LPF version since a PCB was available. I matched all of the transistor pairs on their Vbe voltage. I used some NOS metal clips to hold the transistor pairs. The resonance was a bit more pronounced than the input signal so I dropped R1 to 200K which provided a better balance. There is some gain loss through this filter so I decided to add an adjustable inverting amplifier on the output. 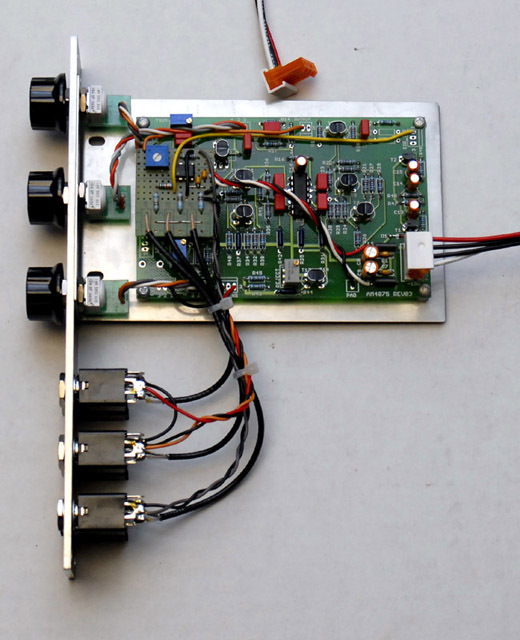 I also added a three input inverting amplifier on the input. The resonance really gives this filter it's 'signature' and sounds exactly like my Avatar. 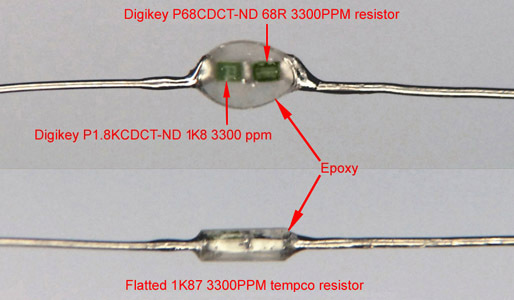 Digikey sells 3300PPM 5% 0805 SMD tempco resistors for about $0.55 each. I made my through-hole 1K87 tempco by soldering together a 1K8 and a 68R 3300PPM SMT tempco resistors and encapsulating them in epoxy. I mounted one lead in my variable speed drill and rotated it slowly while layering fast setting epoxy on the resistors. This shaped the epoxy into a nice elliptical shape. As the epoxy hardened I flattened the sides so it would fit tight between the differential pair transistors. Part numbers are on my parts and construction page. I decided to build this in a 1U panel with a similar layout to the MOTM-490 filter. Here is the finished panel using HPGL graphics for the tick marks. These significantly reduce the cost of the finished panel. Here is the finished module using a Stooge long bracket shortened by 1". The chiclet PCBs from John Loffink really make the assembly with Spectrol potentiometers very nice. Notice that these are the new white RoHS compliant potentiometers.